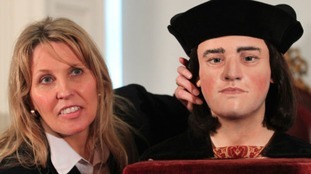 Philippa Langley, the historian who led the team that unearthed King Richard III's skeleton in a Leicester car park, is to announce a new quest today - according to The Independent newspaper. She's tipped to make the announcement at the celebrations for the 530th anniversary of the Battle of Bosworth. She's going to look into the true fate of two young princes - who disappeared from the Tower of London, just before the elder was due to be crowned king. It's always been suspected that King Richard killed them to then seize the throne. She will team up with "cold case investigators" - some who work with police forces on unsolved murders. The paper quotes Langley as saying: "it's very questionable whether there was a murder at all". She won't, however, be allowed to investigate the chapel in Westminster Abbey where the bones of the princes are said to have been buried by Charles II. Two children's skeletons were discovered in the Tower of London in 1674.